Stay stitching is a single line of stitching through one layer of fabric. It is sewn to stabilize the fabric and prevent it from becoming stretched or distorted. Though you may be tempted to skip this step, it's very important and will ensure that your handmade clothing drapes properly. Stay stitching can mean the difference between a great garment and one that's not very wearable. This type of stitch is usually called for on the edge of a piece of fabric that has a bias cut, which can become distorted more easily than other fabric grain cuts. It's also commonly used on curved cuts, such as necklines, to ensure pieces fit together properly in the most crucial places. Sewing the stay stitching in a certain direction is referred to as directional stitching. The intent is to keep the shape of the fabric the same as it was when you cut it out. If you were to sew the opposite of the suggested directional stitching, you are counteracting the reason for stay stitching and will likely end up with distorted pieces, despite your efforts. The same stitching width and length that will be used to construct the garment can be used for stay stitching. Unlike basting or ease stitches, stay stitching is not removed. Stay stitching will not be seen on the outside of the garment unless you accidentally stitch over a seam line. It is merely meant to be a reinforcing piece of the garment's construction. There are three types of fabric grain: lengthwise grain, crosswise grain, and bias grain. Bias grain refers to the thread line that is at a 45-degree angle to the lengthwise and crosswise grain of fabric as it is on the bolt. The bias has stretch in woven fabric and will hang differently than a garment that has been cut on the lengthwise or crosswise grain. This naturally occurring difference is why stay stitching is particularly important on the bias. 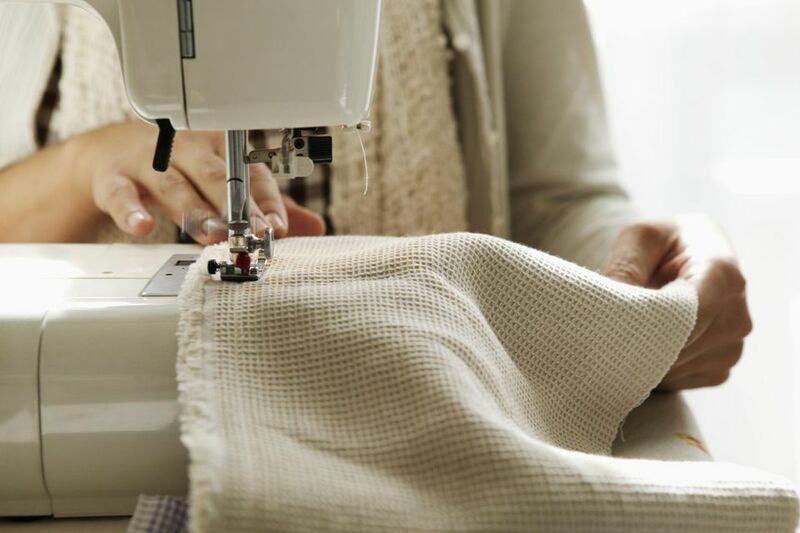 Although it may seem like you are accomplishing nothing and it's a step you can eliminate, if your pattern directions call for stay stitching, do it! It's too easy to think you are saving yourself some time by skipping this step. In reality, a few minutes of your time now will prevent all kinds of problems in the later steps when you're sewing the pieces together. Fabric that hasn't been stay stitched is very apt to become distorted while you press the pieces or add interfacing to the fabric. Even simply handling the cut-out fabric can move fibers around in unwanted ways. By the time you start to join the pieces of fabric without stay stitching, they may be so out of shape that you have a battle on your hands to make the pieces fit together. This can be especially problematic with collars and facings or when two types of fabric grain are sewn together. For example, if the neckline edge of a garment is cut on the bias but the collar is on the straight grain, a stay stitch will ensure the two fit properly. Not all skirts or dress patterns will tell you to stay stitch, so it's always best to use your own judgment. The more loosely woven your fabric is, the more likely the threads of the fabric will move and become distorted. When in doubt, stay stitch.